Hermann Esser, the son of a civil servant, was born in Röhrmoos, Bavaria, on 29th July, 1900. He served in the German Army in the later stages of the First World War. Esser returned to Germany as a radical socialist and took a job working for a left-wing provincial newspaper. Esser was originally a member of the German Social Democrat Party but in 1919 he joined with Anton Drexler, Gottfried Feder and Dietrich Eckart to form the German Worker's Party (GPW) in Munich. The German Army was worried that it was a left-wing revolutionary group and sent Adolf Hitler, one of its education officers, to spy on the organization. Hitler discovered that the party's political ideas were similar to his own. He approved of the GPW's German nationalism and anti-Semitism but was unimpressed with the way the party was organized. Although there as a spy, Hitler could not restrain himself when a member made a point he disagreed with, and he stood up and made a passionate speech on the subject. 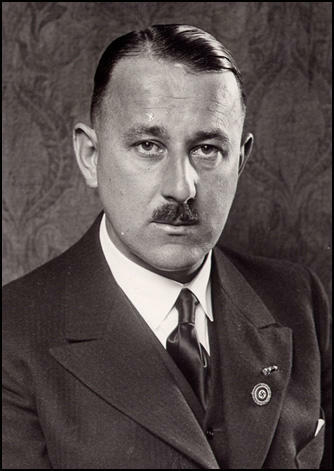 Anton Drexler was impressed with Hitler's abilities as an orator and invited him to join the party. At first Hitler was reluctant, but urged on by his commanding officer, Captain Karl Mayr, he eventually agreed. He was only the fifty-fourth person to join the German Workers's Party. Hitler was immediately asked to join the executive committee and was later appointed the party's propaganda manager. In the next few weeks Hitler brought several members of his army into the party, including one of his commanding officers, Captain Ernst Roehm. The arrival of Roehm was an important development as he had access to the army political fund and was able to transfer some of the money into the GWP. The German Worker's Party used some of this money to advertise their meetings. Adolf Hitler was often the main speaker and it was during this period that he developed the techniques that made him into such a persuasive orator. Esser was considered the GWP's second best speaker. They were both rabble-rousers who made emotional attacks on Jews and the government. Hitler's reputation as an orator grew and it soon became clear that he was the main reason why people were joining the party. This gave Hitler tremendous power within the organization as they knew they could not afford to lose him. Adolf Hitler advocated that the party should change its name to the National Socialist German Workers Party (NSDAP). Hitler had always been hostile to socialist ideas, especially those that involved racial or sexual equality. However, socialism was a popular political philosophy in Germany after the First World War. This was reflected in the growth in the German Social Democrat Party (SDP), the largest political party in Germany. Esser, the editor of Volkischer Beobachter, was in charge of Nazi Party propaganda. He did not take part in the Beer Hall Putsch in 1923 and was accused of cowardice. He claimed he was ill and spent the day in bed. Esser fled to Austria and when he returned in January 1924, he was sentenced to three months' imprisonment. After his release, he visited Hitler in Landsberg Castle in Munich and gradually won his forgiveness. Konrad Heiden described Esser as the "arch-type of the National Socialist" and his biographer, Louis L. Snyder, claimed that: "Esser lacked the inhibitions that even Hitler had. Crude and uncultured, of low moral character, Esser was involved in one escapade after another. A brash, arrogant rowdy, he was arrested again and again for unlawful behaviour. 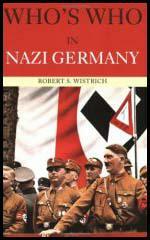 The scandals in his private life proved to be a liability even for the Nazi Party." His main opponent in the party was Gregor Strasser: "Esser's private life is immoral. His actions are egotistic. His behaviour in November 1923 was cowardly and most unworthy of a real National Socialist." Strasser, Alfred Rosenberg and Ernst Roehm, were anxious to take part in the national and State elections in the spring of 1924. Hitler, who was not a German citizen, was automatically excluded, and had from the beginning attacked all parliamentary activity as worthless and dangerous to the independence of the movement. Hitler was now concerned with the threat to his personal position as leader of the Party if others were elected to the Reichstag while he remained outside. Despite Hitler's opposition, supported by Esser and Julius Steicher, the Nazi Party did well in the elections, with Strasser, Roehm, Gottfried Feder, Wilhelm Frick and Erich Ludendorff winning seats. William L. Shirer, the author of The Rise and Fall of the Third Reich (1964), has claimed: "He (Esser) made no secret that for a time he lived well off the generosity of some of his mistresses. A notorious blackmailer, resorting to threats to expose even his own party comrades who crossed him, Esser became so repulsive to some of the older and more decent men in the movement that they demanded his expulsion." Hitler told them: "I know that Hermann Esser is a rascal, but I must use him as long as he is of any use. I must keep him near me so that I can watch him." Hitler admitted that he had to use him wisely: "I can use him as a speaker for a certain type of public. But I shall never give him political responsibility." Shirer points out that this was Hitler's way of dealing with characters like Esser. "This was to be his attitude toward almost all of his close collaborators, no matter how murky their past - or indeed their present. Murderers, pimps, homosexual perverts, drug addicts or just plain rowdies were all the same to him if they served his purposes." In 1928 Esser gained considerable publicity when Gustav Stresemann, then Minister of Foreign Affairs, went to Munich to deliver a speech. Esser led 500 members of Sturmabteilung (SA) into the hall to disrupt the meeting. The following year he was elected to the Munich City Council. In 1932 he became a delegate to the Bavarian Landtag. Adolf Hitler gained power in 1933. He appointed Esser as the Bavarian minister of economics. It was claimed that in this post he forced Bavarian industrialists to contribute large sums to the state treasury. In March 1935, Hitler sacked Esser. Louis L. Snyder has speculated that Esser was removed because of his continuing scandalous personal life. "It was alleged, among other charges, that Esser had assaulted a young girl, the daughter of a prominent Munich businessman, and the subsequently there had been a nasty public scene." During the Second World War he faded into the background. This meant that he escaped appearing at the Nuremberg War Crimes Trial. Esser was arrested but released in 1947. However, in 1949 he was arrested again and this time he was found guilty of being a major offender of propagating Nazi ideology. He was found guilty and sentenced to five years' forced labour. Hermann Esser died in Dietramszell on 7th February 1981. He (Esser) made no secret that for a time he lived well off the generosity of some of his mistresses. A notorious blackmailer, resorting to threats to expose even his own party comrades who crossed him, Esser became so repulsive to some of the older and more decent men in the movement that they demanded his expulsion. "I know that Hermann Esser is a rascal, but I must use him as long as he is of any use to me". This was to be his attitude toward almost all of his close collaborators, no matter how murky their past - or indeed their present. Murderers, pimps, homosexual perverts, drug addicts or just plain rowdies were all the same to him if they served his purposes."